Very limited run of LPs designed by Maja Larsson with photos of my bedroom. out of stock. Order through the label or distributors. The field recording, er, field has become more crowded and less pastoral in recent years, and some of the most enduring works responding to sound and location have been what you might call field auto-recordings—pieces where the microphone is turned towards instead of away from the recordists themselves. From Kevin Drumm’s recordings of music made around his home, where the feel of the space and the passing of time weighs even more heavily than usual, to Vanessa Rossetto’s impartial mapping of her journey through a New Orleans festival on Whole Stories, to Graham Lambkin’s poker-faced poeticisation of the mundane on Photographs and Amateur Doubles, the recordist has become an unreliable narrator in these multilayered dispatches from their chosen field. 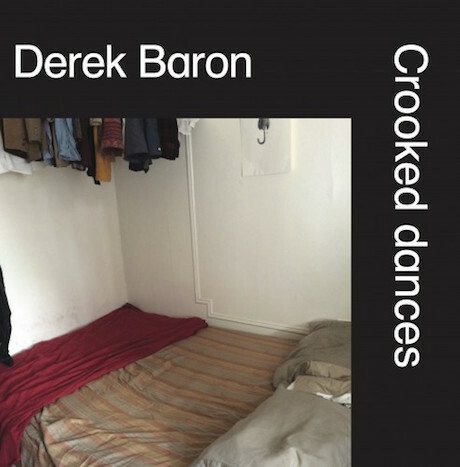 US musician Derek Baron’s Crooked Dances presents recordings from what is fast becoming a contested sphere: shared living spaces, in this case in Brooklyn. The album presents what are apparently Baron’s performances of Erik Satie piano pieces such as Danses Gothiques — presumably on some kind of electronic keyboard, given the cramped living space hinted at by the cover — interspersed with muted discussions about splitting utility bills and the sounds of doors opening and closing on hidden rooms beyond. The playing is even and unhurried, an oasis of calm against the intrusion of the outside world. But the muted, businesslike discussions with his flatmates hint at the diplomatic detente that co-habitants are forced to maintain. Crooked Dances is more than just a modern spin on Satie’s idea of furniture music. It addresses, obliquely, one of the most pressing concerns of young people in Western megacities—where to live—and literally tests the limits of polite society. But like many of the most inventive recent uses of field recording, it also leaves you wondering who and where the artist is.